Robert Wilcox sounds off, 1898. R. W. Wilcox Corrects Statements in Ex-Queen’s Book. Only Surviving Members of Royal School Destined to Be Rulers of Hawaii. As some of these geneologies and foot notes are incorrect, and for the sake of young students of Hawaiian history, I now undertake to give true correction on these pedigrees, and supported by Hawaiian authorities, such historians and geneologists as S. M. Kamakau, A. Fornander, J. K. Unauna, P. S. Pakelekulani and others. Appendix E, No. 1—Geneology of Liliuokalani.—(On her mother’s side). This geneology is all right except the foot note. Kepookalani [Kepoookalani], son of Kameeiamoku, the father, and Kamakaeheikuli, the mother, was half-cousin of Kamehameha I on their mothers’ side alone, and not a first cousin. Thus, Haae-a-Kauauanui-a-Mahi, with Kekelaokalani, (sister of Keeaumokunui) begat Kekuiapoiwa II who became Keoua’s third wife, and became the mother of Kamehameha I and Kalanimokuioku-i-Kepookalani alias Keliimaikai. Haae with Kalelemauliokalani begat two daughters, Kamakaeheikuli and Haalou. As Kamakaeheikuli was a half-sister of Kekelaokalani, consequently Kepookalani was a half-cousin of Kamehameha I. (Vide, Fornander, Unauna and others). No. 2.—(On her father’s side). To make this geneology complete we must add more wife to Kalaninui-Iamamao, whose name was Kapaihi-a-Ahu, mother of Kaolanialii. Thus, Kalaninui-Iamamao took his own daughter Kaolanialii for one of his wives, after the tragic death of Kapaihi-a-Ahu. Therefore, Alapaiwahine, daughter of Kaolanialii and great grand mother of Liliuokalani became an Alii-naha, one of the ancient ranks of high chiefs. No. 1—Geneology of Kamehameha I. This geneology is correct, except the foot note is wrong. Heulu and Kamakaimoku are half-brother and half-sister, and as Heulu was Keawe-a-Heulu’s father and Kamakaimoku was Keoua’s mother. Therefore, Keawe-a-Heulu and Keoua were half-cousins and not direct first cousins. No. 2—Geneology of Kamehameha I. This geneology is incompleted; Keeaumokunui had a sister, Kekelaokalani who was Haae’s tabued wife and mother of Kekuiapoiwa II. The fott note is misleading again, Kalaninui-Iamamao and Keeaumokunui were half-brothers, both were sons of Keaweikekahialiiokamoku of different mothers. Geneology of Kepoookalani, son of Kameeiamoku, grandson of Keawepoepoe, and great grand father of Liliuokalani is badly mixed up. The food notes of it are nearly all incorrect. Haae’s father, as I already stated was Kauaunui-a-Mahi [Kauauanui-a-Mahi], the mother was Kepoomahana. “The Royal Twins of Kekaulike,” as they were called, Kameeiamoku and Kamanawa were the sons of Keawepoepoe, son of Lonoikahaupu with Queen Kalanikauleleiaiwi their mother was Kanoena, a daughter of Lonoanahulu of the great Ehu family. Kekelaokalani sister of Keeaumokunui, Keoua’s aunt, was Haae’s tabued wife heretofore mentioned, and their issue was Kekuiapoiwa II, who was married to her first cousin Keoua, and begot Kamehameha I and Kalanimalokuloku-i-Kepoookalani alias Keliimaikai as stated before. But Kekelaokalani wife of Kamanawa and mother of Peleuli was another Kekelaokalani entirely. She was a daughter of Kauakahiakua and Kekuiapoiwanui, half sister of Keeaumokunui and Kekelaokalani I, son and daughter of Keaweikekahialiiokamoku, and Kalanikauleleiaiwi, king and queen of Hawaii. (Vide Fornander, page 320). Keoua whose full name was Kalanikupuapaikalaninui Keoua, son of Keeumokkunui [Keeaumokunui] and grandson of Keaweikekahialiiokamoku, who during his youth went to Hana, East Maui, in search of the hands of the most tabued chifesses of Kahikikalaokalani and Kalanilehua, who were great great grand-daughters of the most exalted tabued reigning chiefess Kaakaualaninui who held the highest and uncommon rank called Poo hoolewa i ka la, Namakehanui who rebelled against Kamehameha I in 1796 on Hawaii was a direct descendant of the aforesaid Kaakaualaninui. The only issue of this marriage by Kahikikalaokalani was a son called Kalokuokamaile, the ancestor of the high chiefess, Elizabeth Kekaaniau (Mrs. F. S. Pratt). (Vide S. M. Kamakau’s and P. S. Pakelekulani’s). Keoua’s next wife was his first cousin Kekuiapoiwa II, mother of Kamehameha I and Keliimaikai. Keoua’s fourth wife was Kamakaeheikuli, daughter of Haae with his other wife Kalelemauliokalani. The issue of this marriage was a son Kalaimamahu, grand father of the late King Lunalilo. Keoua’s fifth wife was Kalola, daughter of King Kekaulike of Maui with Kekuiapoiwanui. (Kalola was a sister of Kamehamehanui and Kahekili). The issue was a daughter, Kekuiapoiwa Liliha, who afterward became the wife of King Kalaniopuu’s son Kiwalao, and became the mother of Keopuolani, mother of Liholiho (Kamehameha II), Kauikeaouli (Kamehameha III) and Princess Haarietta Nahienaena. His sixth wife was Manononui, daughter of King Alapainui of Hawaii, with Kamakaimoku. (Kamakaimoku was also the mother of King Kalaniopuu and Keoua. Their issue was a daughter called Kiilaweau who became the wife of Keliimaikai and mother of the celebrated Kekuokalani [Kekuaokalani]. (Vide S. M. Kamakau’s histor of Kamehameha I). Keoua’s seventh wife was Akahinui, their issue was a son called Kaleiwohi who became grand father of the late chiefess Akahi of Keei, Kona, Hawaii. It is inexplicable how the ex-Queen used Fornander’s as her authority, and yet Fornander’s pedigree on geneology of Kepookalani [Kepoookalani] is very far from the same. On appendix F, the ex-Queen attempted to correct Alexander’s geneology, but here she made still a gross mistake by denying that Keliimaikai had no issue, and Kiilaweau was a man. Yes, there was a man by that name who was supposed to have been the father of M. Kekuanaoa instead of Nahiolea; but Kiilaweau, wife of Keliimaikai, was a daughter of Keoua and Manononui, as heretofore mentioned, and who became the mother of the celebrated Kekuaokalani, husband of the valiant and faithful Manono II. (Vide S. M. Kamakau history of Kamehameha I). Manono II was a daughter of Kalola-a-Kumukoa and Kekuamanoha, a half-brother of Kahekili, King of Maui. Keliimaikai is supposed also as one of the fathers of Kaonaeha [Kaoanaeha], grand mother of Queen Emma and Prince A. K. Kunuiakea. (Vide Kuokoa, October 5, 1867, by S. M. Kamakau). The only chief known by the name of Hoapili-kane was Ulumaheihei, who was a constant companion and aikane of Kamehameha I, and through that he was called afterward, Ulumaheihei Hoapili. He was one of the sons of Kameeiamoku with his second wife, Keliiokahekili, a daughter of Kanekapolei. Kameeiamoku’s first wife was Kamakaeheikuli, their issue was Kepoookalani, great grand father of Liliuokalani and his (Kameeiamoku’s) last wife was Kahikoloa, and their issue was a son, Hoolulu, grand father of the late Governor F. W. Kahapula Beckley, Maraea Kahaawelani and George Mooheau Beckley. Ulumaheihei Hoapili was one of the few chiefs in whom Kamehameha I had the greatest confidence, in fact the only one he entrusted with his bequest to hide his bones according to ancient custom. Between Hoapili and his half-brother Hoolulu, accordingly, this sacred mission was carried out; and at his death in 1819, Hoapili entrusted Hoolulu the bearing away of the corpse of the great Kamehameha. The ceremony was performed at dark of night. It is only surmised that the corpse of the great conqueror was put in some of the secret caves of Kona, Hawaii, but some say it was consigned to the deep sea. One of the descendants of Hoolulu now bears the name of Kaawelani on the above account, meaning the bearing of Hoolulu the corpse of Kamehameha I on his back. Ulumaheihei Hoapili and his wife Kaheiheimalie, one of the widows of Kamehameha I and mother of Kinau and Queen Kamamalu were strong supporters of the earlier missionaries and who gave them the names of Hoapilikane and Hoapiliwahine. Hoapilikane’s first wife was Kalilikauoha, a daughter of King Kahekili who became the mother of the high spirited chiefess Kuini Liliha, wife of Boki. There is only one undisputed branch of the great house of Keoua living through the primogeniture of the issue of Keoua with his Hana, East Maui wife through Kalokuokamaile by his only descendants the High Chiefess Elizabeth Kekaaniau and the issue of her brother Gidion K. Laanui [Gideona K. Laanui], called Theresa Owana Kaohehelani. It is a matter of historical note handed down to this day that Kamehameha I, in fact during his reign on several occasions of gathering of chiefs and chiefess, Kaohelelani, daughter of Kalokuokamaile and wife of Nuhi the son of the great reigning Chief Hinai of Waimea, Hawaii, she was always recognized by the conqueror as the Seniority line of the Keoua family and was always treated with a special distinction than all the other chiefesses of his court. Mrs. F. S. Pratt was one of the first party of eight children, three boys and five girls, who entered the Royal school (of Mr. and Mrs. Cooke) for chiefs’ children established by Kamehameha III, in 1840, but afterward the pupils were increased up to fifteen, among these number were Queen Liliuokalani, Queen Emma and others. Queen Liliuokalani and Mrs. F. S. Pratt are the only living representatives of the elligible number who comprised those that were destined to be rulers of Hawaii nei. (Vide R. C. Willie’s pamphlet, The Friend, 1844). And if we accept Keliimaikai was the father of Kaoanaeha instead of Kalaipaihala, then Prince Albert K. Kuniakea [Albert K. Kunuiakea] becomes one of the descendants of the illustrious house of Keoua. Therefore, the only heirs next of kin to Kamehameha I line are the aforesaid persons. Even on Kamehameha First’s mother’s side, the Kalokuokamaile line come in again the nearest heirs through Kekelaokalani, than those who are claiming through other issues of Haae with whom Liliuokalani are connected. Honolulu, H. I., April 12, 1898. [It is worth noting that Wilcox repeatedly calls Liliuokalani, “ex-Queen” and submits this critique to the Pacific Commercial Advertiser, a newspaper which is at this time ostensibly against the monarchy. His criticisms are written in English most certainly because the Queen’s book was published in English. The Pacific Commercial Advertiser, Volume XXVII, Number 4928, Page 5. May 25, 1898. In anticipation of King Kalakaua’s return from his tour around the world, 1881. HONORING THE ALII, KING KALAKAUA. The Marshals of the Day. 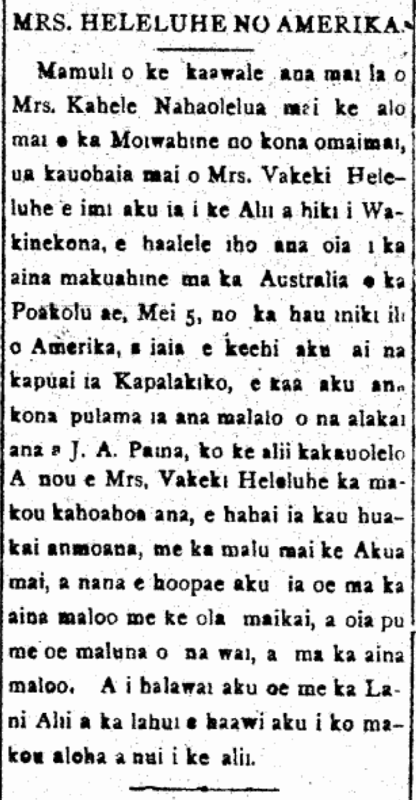 More on Mrs. Heleluhe going to take the place of Kahele Nahaolelua, and name variations, 1897. MRS. HELELUHE HEADED FOR AMERIKA. Because Mrs. Kahele Nahaolelua has been away from the presence of the Queen due to her illness, Mrs. Vakeki Heleluhe has been ordered to seek out the Royal One in Washington; she will be leaving the mother land on the Australia of this next Wednesday, May 5th, for the skin-nipping cold of America, and while she is treads through San Francisco, her care will be under the guidance of J. A. Palmer [Pama], the Queen’s secretary. And for you, O Mrs. Vakeki Heleluhe, is our prayer, that your ocean voyage be accompanied by God’s protection and may he put you ashore on dry land in good health, and may he be with you on water and on land. And when you meet with the Heavenly Alii of the lahui, give the royal one our great aloha. [According to David Forbes, from the new edition of “Hawaii’s Story,” Mrs. Heleluhe was sometimes referred to as “Waikiki”. Here we see her as “Vakeki”. See another article on Mrs. Heleluhe’s departure here. Ke Aloha Aina, Buke III, Helu 18, Aoao 6. Mei 1, 1897. Marriage of Pauahi and Charles Reed Bishop, 1850. “[Bernice] was one of the most beautiful girls I ever saw; the vision of her loveliness at that time can never be effaced from remembrance; like a striking picture once seen, it is stamped upon memory’s page forever. She married in her eighteenth year. She was betrothed to Prince Lot, a grandchild of Kamehameha the Great; but when Mr. Charles R. Bishop pressed his suit, my sister smiled on him, and they were married. It was a happy marriage. [I was going to put up an article from the newspapers announcing their wedding, but it seems that there are none online. As for the Polynesian, the issues from March 23 to May 11, 1850 are missing. For the Honolulu Times which begins in 1849, there are none online at this time. 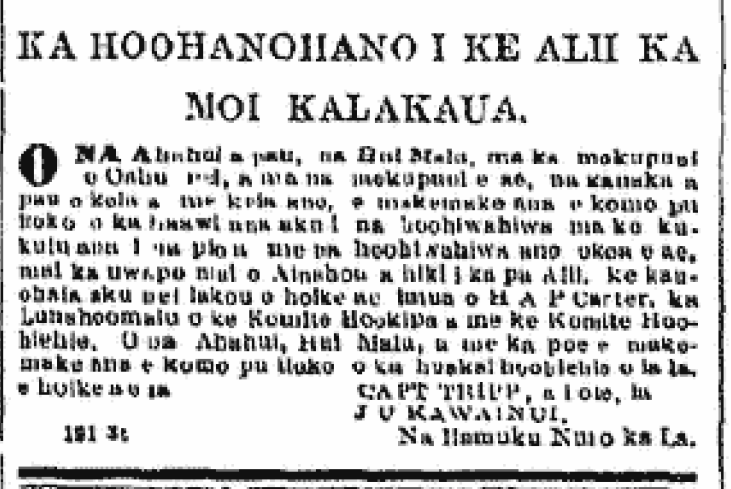 The Hawaiian-Language Newspaper, Elele, is not currently available online (or on microfilm) after Augate 14, 1849. And it doesn’t seem to be covered in The Friend, which can be found here online through the efforts of the Mission Houses Museum. One of the early students at the Chiefs’ Children’s School, Jane Loeau, dies, 1873. Passed On.—On the morning of the 30th of July, Jane Loeau left this life, and her spirit returned to He who made it. Loeau reached the age of 45; she is of an alii family of Kauai, and it is said that she was a grandchild of Kamehameha I.
Ka Lau Oliva, Buke III, Helu 8, Aoao 2. Augate 1, 1873. After finding out what the given name of the Consul General from Japan was in 1895, it was easier to find other information about him, like this picture from the Chicago Daily News. It seems he served as Japanese Consul in Chicago a few years after leaving Hawaii.